Do sharks spend most of their time close to the shore? The exact movements and behaviours of sharks have, for very long, been a topic of debate. The previous theory held the fact that sharks spend most of their time close to the shore in high regard. 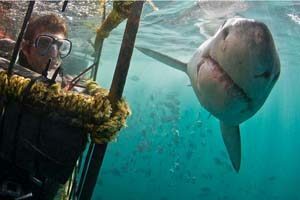 However, after close monitoring, it was found that sharks travel further and deeper than was initially thought. Roughly half of their time is spent swimming through deep ocean waters, although the reasons for this are still undetermined. How far do sharks actually travel? There is no true estimate of how far sharks can swim at any given time. However, through tagging, it was discovered that sharks are independent of each other and will swim different distances at any given time. In fact, one of the tagged Great White Sharks swam an impressive 3800 kilometres to waters off the coast of Hawaii (it was originally tagged in California). This was, perhaps, the biggest surprise for researchers. The sharks were found to inhabit a wider range of water temperatures, with the colder, deeper waters being at about 4.8 degrees Celsius to waters closer to shore, which average at about 26 degrees Celsius. This proved that sharks are far more versatile and adaptable than was previously thought. This is one of the biggest myths relating to sharks. While they may be at the top of the food chain, they are still considered endangered. Not much is known about the mating habits of sharks, and the figures that researchers have are all based on rough estimations. However, it is becoming increasingly apparent that the number of sharks swimming in our oceans are less than desirable. While sharks continue to evade and baffle scientists, the new technologies that are in place are slowly starting to open up the doors and educate the world on the mysterious behaviours of sharks.